If you have an old fluorescent light fixture and the fluorescent tube is on its last legs, flickering or dimming, you could just replace the fluorescent tube and perhaps the associated ballast. But there is a much smarter solution available, thanks to LED technology. Compared to traditional fluorescent lighting, modern tubes made with light-emitting diodes will last much longer and cut your energy bills substantially. Should I convert from a fluorescent tube to LED? Among their many benefits, LEDs offer money- and environment-saving features: longer life, lower energy consumption and an absence of toxic mercury. LEDs also cast a much more directional light than fluorescent tubes, which means they put the light where you want it (down on the finished floor or work surface) rather than in places where it's wasted (up into the fixture). True, LED lighting tubes cost more than fluorescent tubes. But as LED lights have become more popular, costs have been coming down, thanks to economies of scale. 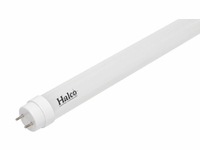 In addition, you can also save the cost of replacing ballasts by making the switch to LEDs. LED linear tubes can last 50,000 hours or more, nearly twice the lifespan of comparable fluorescent tubes. That means that over time, you will be buying fewer replacement tubes. If you are paying someone to make the replacements, it also translates into savings in labor costs over time. The real savings can come over the long term, thanks to LED lighting�s miserly energy use. Compared to fluorescents, LED lights can save you 20 percent to 50 percent or more in energy costs. Do the math and you will find that switching to LED lighting will more than pay you back for your initial investment over time. In fact, given the long-term cost savings involved, why would you wait? Besides benefiting your wallet and your bottom line, LED lights also help the environment. By burning less energy and requiring fewer replacements, they cut carbon emissions and landfill clutter. In addition, LED lights contain no mercury, unlike their fluorescent counterparts. This component is so toxic that state and local laws require that fluorescents be recycled rather than dumped in the trash. Furthermore, fluorescents are fragile and can break, endangering the environment and the people around them. LED lights, on the other hand, are shatterproof and much sturdier than fluorescents. That makes them a safer all-around choice for any application, particularly if children are using the space to be illuminated. Besides environmental and economic considerations, LEDs offer other benefits. Unlike fluorescents, they will not give off an annoying, flickering light. LEDs also deliver a brighter light, making them ideal for workspaces and accomplishing tasks. And unlike fluorescent lamps, LED tubes do not have a slow warm-up period; instead they power up to 100% brightness instantly. In addition, LEDs are available in a wide range of color temperatures, from warm to cold, giving you the ability to choose the LED that�s just right for the space you will be lighting and the use it will get. When you sum up all the pros and cons of LEDs, you can see that they yield a net positive, whether for residential, commercial, or industrial use. When you decide to replace your fluorescent tubes with tubular LED lamps (or TLEDs), you have three basic options. You can keep the existing ballast and use ballast-compatible Type A LEDs for installation, or you can opt for ballast-bypass Type B LEDs, which don�t use a ballast and have their own internal driver. The third option, Type C, uses no ballast, like Type B, but has an external driver. Ballast-compatible LEDs give you instant, plug-and-play results. You just remove the old fluorescent tube, plug in your new LED tube, and flip the switch. There�s no need to remove the old ballast. It�s a super easy installation with reduced up-front labor costs. Although convenient, this option has a couple of disadvantages over the long term. Type A ballast-compatible LEDs tend to be more expensive than their bypass counterparts. Also, although they are more energy-efficient than fluorescents, they are not as energy-efficient as ballast-bypass LEDs. Expect to save about 20 percent in energy usage with ballast-compatible LEDs, compared to fluorescents. Not every Type A LED tube is compatible with every make and model of ballast. You�ll need to verify which ballast you have and whether or not it is compatible with the Type A LED you�re looking at. Dimming control is limited to the capability of the ballast. The last big drawback to ballast-compatible LED tubes is the fact that that the old ballast is still in operation and is still a point of failure. So even if the LED tubes are working fine, when the ballast fails over time, the LED tubes will go dark and you will still have to get back up into the fixture and replace it. Type B ballast-bypass LED tubes require the removal of the old fluorescent ballast. These tubes have their own internal driver and run directly off line voltage. The lamp sockets, or tombstones, may also require rewiring. There is additional labor involved in the initial installation versus ballast-compatible LEDs, but the end result is a much more reliable and longer-lasting assembly as the old ballast is eliminated from the circuit. Limited dimming capabilities are available. Although Type B ballast-bypass LEDs tend to be a little more expensive than ballast-compatible LEDs, they can save you an additional 20 percent in energy usage (for a total of about 40% over fluorescent tubes). That means they will pay for themselves in the long run. Like Type B LEDs, Type Cs will also require removal of the existing tube and ballast, and some rewiring. But in addition, the Type C will also necessitate an external remote driver and connecting it to the sockets. Opting for these LEDs with external drivers will entail some extra labor and expense, but it will pay off with even better efficiency and higher performance. These LEDs provide the best dimming and controlling options too. Although they provide better efficiency, Type B and Type C LED lamps require a little more installation time and know-how. Removing or bypassing the old ballast will require some rewiring of your light fixture. Although this can be done with ordinary household tools and is not particularly difficult, you should consult with a qualified electrician if you are not handy or knowledgeable about electricity, wiring, and lighting. Also, if you are thinking about taking this on as a DIY project, you should make sure to wear eye protection to protect your eyes in case the fluorescent tube shatters during removal. And, of course, you should always refer to the manufacturer�s instructions before retrofitting your LED linear lamps. IMPORTANT: Always refer to the manufacturer�s installation instructions prior to retrofitting your LED linear lamps. Are you confused, or do you still have questions? We are just a phone call or email away, and our lighting experts will be happy to work with you to help you decide what�s best for you and your application. Contact us today and let us assemble a custom quote for converting your project's linear fluorescent tubes to LED.